Make sure all of your transcripts are turned in to the Graduate School. The sooner this is completed, the better. Upon entrance into the CBS Graduate Program, the Director of the CBS Graduate Program will direct the graduate student’s program and act in the capacity of an adviser until the student selects a faculty mentor. Students are expected select a mentor as early as possible in their graduate training (preferably by the end of their first Fall semester). All first year students who have not selected an adviser upon entering the program should schedule ~3 laboratory rotations on a 6-8 week basis with faculty members of their choice who have lab openings. The objective of these rotations is to provide the student with an introduction to various technical aspects of biomedical research and to introduce the student to the research program, mentorship style, and lab culture of individual faculty members. Lab rotations are arranged by contacting and meeting with individual faculty members after consultation with the Director of Graduate Programs. If a student does not find a mentor at the competition of these three rotations, then they are allowed to add additional rotations during their second semester with permission from the Director of Graduate Programs. Once a student selects a mentor, their mentor must fill out a Declaration of Thesis Advisor (DTA) form and have it signed by their department head. The form must then be submitted to the Coordinator of Graduate Programs. This form should be filled out whether or not the chair will be paying the students expenses. If the student is self-funded that should be notated on the form. Once a mentor is chosen and a DTA form is submitted, the student and mentor should begin collaborating on the rest of the student’s graduate committee (completed during second semester/first summer). This committee will serve to direct, advise, and guide the student through the PhD program. PhD committees must be comprised of at least 4 members (3 total for Masters). You must have either 1 chair (thesis-advisor) or 2 co-chairs. Your mentor can qualify as a chair if they have graduated a student in the past. If not, they must have a co-chair who has. Your committee must have either 2 or 3 more members depending on whether you have a co-chair or not. These remaining members can consist of other members of NCSU faculty, a minor representative, if you plan to minor in something, or Inter-Institutional member from a qualifying university (Duke, Chapel Hill, etc.). Inter-Institutional members require approval by the Graduate School, which can be completed by filling out this form and submitting it to the Coordinator of Graduate Programs. You are also allowed to add faculty from other universities or people from industry. These members will not count toward your required 4 members. Members of graduate faculty from other universities are called External Members and are a voting member of your committee. People from industry are called Technical Consultants and are not voting members of your committee. These members must also get approval from the Graduate School, which can be done by filling out this form and submitting it to the Coordinator of Graduate Programs. You will be assigned a fifth member before your prelim called the Graduate School Representative (not for Masters). This person will only participate in your Prelim and Final exams. If you are assigned one before you submit your Prelim Exam request form to the Graduate School, please make sure to include them when scheduling your exam. You will also need to include them when scheduling your defense. Once you have formed your committee, please put them into your Plan of Work in MyPack Portal (same location as your Patent Agreement). Once the committee is formed, students should schedule their first committee meeting (end of first year/beginning of second year). At the conclusion of this meeting, the student’s mentor should submit a Graduate Committee Report (GCR) form to the Coordinator of Graduate Programs and Director of Graduate Programs. These meetings will then occur yearly and a new GCR form should be submitted at the conclusion of each meeting. At the first meeting, the student and committee should finalize all of the courses the student should take for the duration of their degree. 72 credit hours for PhD students and 36 hours for MS students are required minimums. At your first committee meeting, you finalize all of the courses you plan to take during your degree from start to finish. You must input 72 credit hours of these courses into your Plan of Work on MyPack Portal (36 for MS students). Please follow the Plan of Work guidelines. Once you input all of the courses, you should reach out to the Coordinator of Graduate Programs to review your Plan before you submit. After the Coordinator of Graduate Programs approves, you can submit. Over the next week or so, you should check back to see if your committee has approved your Plan. If they have trouble, contact the Coordinator of Graduate Programs for assistance. You will be assigned a Graduate School Representative by the Graduate School some point between when your Plan is submitted and your Prelim Exam. You can make updates to your Plan as needed after it is approved. Please consult the Coordinator of Graduate Programs before doing so. You should also submit a request to declare your concentration to the Coordinator of Graduate Programs before the end of your second year. Simply email a request to cvmgradprogram@ncsu.edu and your concentration will be updated. DO NOT assume your concentration has been declared. If you do not have one declared before you apply for graduation, the wrong concentration/no concentration will be listed on your diploma. Doctoral students are expected to take a comprehensive preliminary examination after the first year, and before the beginning of the third year (absolute deadline is within 4 years of degree). The student should schedule this examination at a convenient time after consulting with his/her advisor and advisory committee. This examination is intended to be comprehensive and assess the student’s preparations to be a scholar in the concentration area discipline. The Request to Schedule form found on the Graduate School Forms page, must be filled out and submitted to the Coordinator of Graduate Programs at least two weeks before the proposed exam date. This form cannot be submitted until the written portion of the exam is passed. The preliminary examination must consist of written and oral components. The written exam must consist of a research proposal and may also include written questions. The NIH NRSA individual fellowship application research plan component is the recommended format for the written examination grant proposal, but the committee can approve another format. The topic of the written examination research grant proposal is proposed by the student and approved by the graduate committee and should be related to (but not necessarily the same as) the thesis project. Students can propose to use a fellowship or research grant proposal planned for actual submission for the written examination research grant proposal. The committee must approve this and the topic of the grant must include independent ideas/hypotheses and aims developed by the student. The first draft of the fellowship or research grant proposal that is entirely the student’s work will be submitted to the committee as the prelim written examination research grant proposal. Grant proposals already submitted to the granting agency may not be used for the prelim written examination research grant proposal. The prelim written examination research grant proposal should be submitted at least one month and up to three months prior to the anticipated oral examination date. The thesis advisor is responsible for submitting the prelim grant to the advisory committee, setting a deadline for evaluation, and soliciting pass or fail grades from each committee member. The committee can provide the student with feedback on the grant proposal that the student will be expected to address in the oral examination. If the prelim grant proposal fails, the student should meet with the committee to discuss options for modifying the existing proposal or seeking a new topic. The committee may also require a closed-book written exam consisting of a series of essay questions or problems based on previous coursework and research. Written questions generally take one day to complete. The committee should agree on the format and provide instructions to the student during the first committee meeting. The written questions exam should be completed by the student and submitted to the committee at least one month prior to the scheduled oral examination. The final oral examination will take place after the dissertation is complete, except for minor revisions that the committee feels are necessary. The examination consists of a public presentation of the thesis research followed by a closed session during which the committee asks questions concerning methods and conclusions reached in the research and as reported in the dissertation. The Request to Schedule form should be submitted at least two weeks in advance to the Coordinator of Graduate Programs, to schedule the final exam. The Permission to Proceed to Final Defense form must also be submitted approximately 3 months before the exam, after it is signed by each member of the student’s committee and the Director of Graduate Programs. The thesis must be submitted within 5 working days of unconditional pass. The ETD editors will then work with students to make updates to the format of the document until the Final Error Free ETD Deadline. The thesis will then be routed to the committee for their final approval before graduation. Students must apply for graduation through MyPack Portal after they receive an unconditional pass on their exam. This must be done before the Apply to Graduate and Doctoral Graduation Attendance Notification Deadline listed on the ETD Webpage. Every year in January students will be prompted by the Coordinator to complete the GSOARS evaluation in MyPack Portal and submit their resumes to the Coordinator. At the same time, Committee Chairs will be prompted to complete annual evaluation forms for each of their graduate students. Students and chairs should meet during this period to discuss the student’s progress. After all evaluations are submitted, students are required to meet with Dr. Sam Jones to discuss their progress. The Coordinator will send out calendar appointment slots for students to choose from. Students are required to provide a Graduate Committee Report (GCR) at their annual committee meetings for their mentors to fill out. 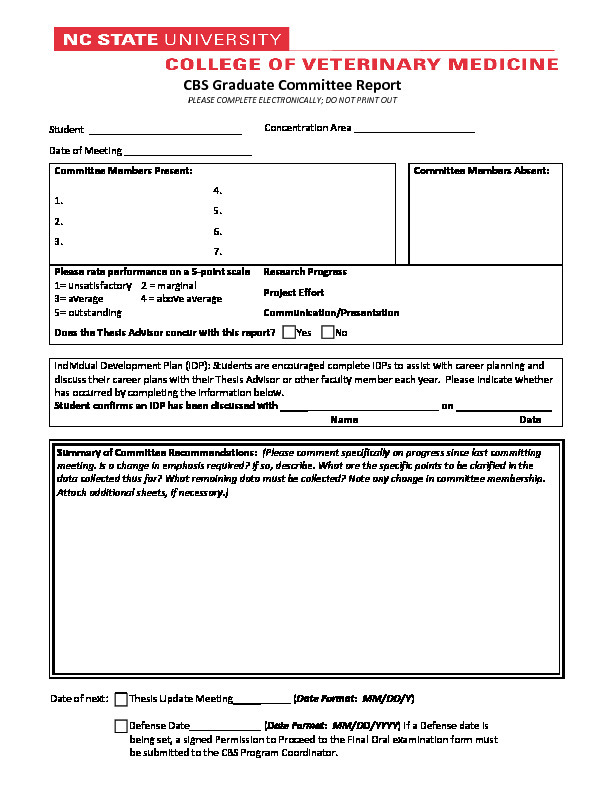 The mentor must submit this form to the Coordinator of Graduate Programs and the Director of Graduate Programs at the conclusion of the meeting. Students in the program select from one of six concentration areas for their graduate research. The Immunology concentration area coursework and laboratory research emphasize cellular and molecular biology studies in infectious disease immunology, mucosal immunity and inflammation, immunopathology, immunotoxicology, immunoparasitology, environmental immunology, and immunology of non-vertebrate species. The diversified faculty is drawn from the Colleges of Veterinary Medicine and Agriculture and Life Sciences as well as government agencies located in the Research Triangle Park. Interdepartmental cooperation provides a unique atmosphere for the study of immunology in a wide range of species. The concentration is designed to prepare students for professional research and teaching careers in applying molecular biology techniques to animal and human health problems associated with environmental stress such as infectious agents and toxins. Immunology graduates are extremely competitive for positions in universities, pharmaceutical companies and governmental institutions. 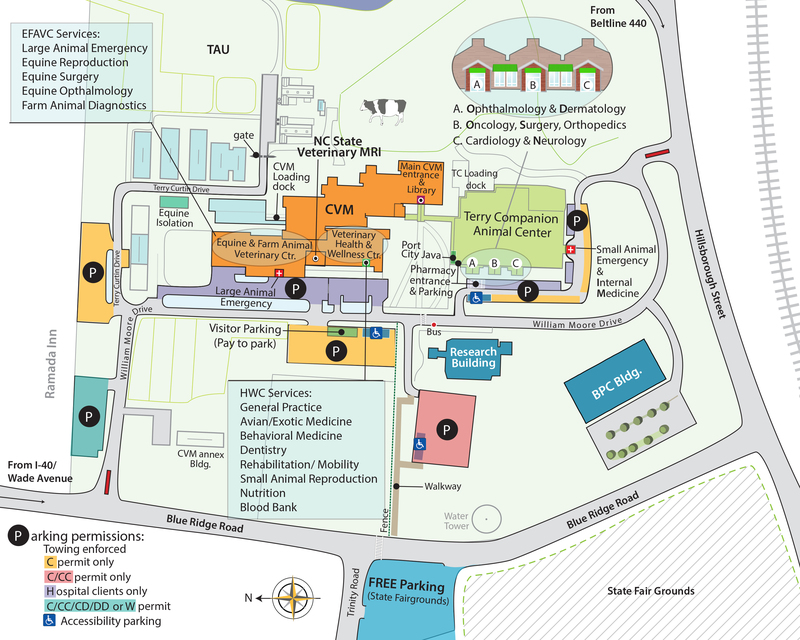 North Carolina State University in Raleigh with close proximity to the University of North Carolina at Chapel Hill, Duke University, and the Research Triangle Park provides a unique biomedical and research environment for seminars, meetings, and interaction with other scientists. Graduate research assistantships are available to qualified students. Course offerings or research facilities are available in the following areas: immunopathology, immunotoxicology, immunoparasitology, mucosal immunology, molecular and infectious disease immunology, aquatic immunology. and environmental immunology. Master’s Degree Requirements: Courses must include at least two 700-800-level immunology courses and one 500-700-level biochemistry course. Doctoral Degree Requirements: Courses include at least two 700-800-level immunology courses, two 500-700-level biochemistry courses, and one 500-level course in statistics. Additional course offered by the Departments of Microbiology, Genetics, Toxicology and the graduate programs in Physiology and Comparative Biomedical Sciences may be taken. The remaining credit hours should include journal club (IMM 816), seminar (IMM 807) and research credits. Other elective courses are approved by the student’s advisory committee. Students requiring foundational courses are encouraged to consider TOX 501 General Toxicology and BCH 451/553 Biochemistry. Aquatic animal epidemiology and ecosystem health, microbial communities, and environmental monitoring. Introductory course for students interested in gaining a broad understanding of: comparative genomics, comparative immunology, comparative physiology, pharmacokinetics, emerging zoonotic diseases, epidemiology and translational research models and methods. This course also provides an overview of current technologies relevant to comparative biomedical research and a foundation for implementing the scientific method (e.g. experimental design, data analyses, statistics). Priority will be given to first-year students in CBS graduate program; Enrollment of all students requires consent of instructor. Introductory course for students interested in gaining a broad understanding of various laboratory methods used in molecular, cellular and “omics” based biomedical research. This course is an introduction to the basic pathologic changes that occur in animal tissues. Inflammation, tissue injury, cancer and the resulting morphology observed at gross, cellular, and the subcellular level will be emphasized. The molecular mechanisms of these processes will be highlighted. DVM students only or by permission of instructor. Changes in tissue from healthy and diseased birds, including poultry, companion, zoological, and free-living species will be covered by system and etiology. Emphasis will be on identification of lesions and their interpretation as a means of obtaining a diagnosis or studying fundamental aspects of avian health. Mathematical models are an important tool for studying the emergence, transmission, and control of infectious diseases. The objective of this graduate course is to introduce mathematical modeling as a research tool to study infectious diseases. This is a highly interdisciplinary graduate course. In previous years, students with very different backgrounds and prior knowledge of mathematics and biology have taken the course. Veterinary epidemiologists play an active role as public service practitioners in agencies tasked with ensuring public, animal, and ecosystem health. Population medicine forum is a seminar-based course designed to provide students with an opportunity to meet other public service professionals engaged in local, regional and global health initiatives. The seminar helps hone critical thinking skills and challenges students to consider the application of alternative approaches to the study of diseases in populations. Epidemiology is considered the “cornerstone” of public health. The application of epidemiology methodology is taught in this course to study disease determinants among populations. Data quality and assurance, critically review relevant published literature, and enhancement of oral and written communication skills, are part of the course. One credit for a 1-hour in depth discussion session of current journal articles presented by students on the subject of gastrointestinal physiology. Journals recommended include the American Journal of Physiology, Gut and Gastroenterology. Each session will focus on one student’s selected paper. MS students are expected to present 1 paper, and PhD students are expected to present up to 2 papers each semester. Students should be enrolled in a graduate course of study in a field related to or focused on physiology. Undergraduate students require special permission. Issues in Preventive Medicine and Public Health is a literature review course designed to assist students with their preparation for careers in public health, ecosystem health, biosecurity and public policy, disaster management, and application for Board Certification in the American College of Preventive Veterinary Medicine. Permission by course instructor required for enrollment. This is a fundamental course that will provide the student with an up-to- date coverage of molecular, cellular, physiological, and circuit-based aspects of modern Neurosciences in the Comparative Biomedical Sciences Graduate Program. Being a graduate-level class, the instructors will assume that the students have acquired some background in basic biology and biochemistry. The most important goal of this course is to train PhD students in neuroscience function and disorders, preparing them for neuroscience research. Emphasis will be placed on the systems and skills needed to pursue experimental neuroscience activities. Important components of the learning process will be presentations from neuroscience experts, class discussions, exams and in class activities. Students with advanced interests in Theriogenology will meet weekly to discuss a wide range of current topics surrounding animal reproduction, including comparative physiology and endocrinology, reproductive management, reproductive pharmacologic/technologic advances in Theriogenology. Each student will be expected to present 2-3 topics with typed, referenced notes and an oral presentation. All students will be expected to actively participate in group discussions and briefly present a review of one topic-related article from the past 5 years during each lecture. The action of drugs in animals and man including basic principles of drug disposition, pharmacokinetics, drug resistance, and signal transduction. Modification of physiological processes by drugs influencing nervous, renal, cardiovascular, and endocrine systems and the antimicrobic and antineoplastics agents. This course will focus on advanced gastrointestinal physiology and the pathophysiology of diseases of relevance to scientists involved in animal-related research. A comparative approach will be presented for much of this material, using the dog, pig, horse, and cow as examples of carnivores, omnivores, herbivorous hindgut fermenters, and herbivorous foregut fermenters respectively when information is available. More importantly, specific topics that are considered to be on the cutting edge of gastrointestinal pathophysiologic research regardless of species will receive additional attention. The physiology portion will advance concepts presented in basic graduate physiology courses, and cover topics such as gastrointestinal motility, digestion, and mucosal transport. Pathophysiological topics, such as gastric ulceration, will be covered in conjunction with lectures on the specific region of the gastrointestinal tract being discussed. In depth study of the basic cellular and molecular mechanisms of immunity, including antigen processing and presentation, T cell development, initiation of the immune response, effector mechanisms, and immunological memory. The course is designed for advanced graduate students who wish to focus on the current concepts in immunology. Mathematical models to describe disposition of drugs and toxic chemicals in the animal body. Areas including classic compartmental and nonlinear models as well as physiological approaches. Discussion of application of these techniques to toxicologicstudies. Presentation and discussions on ongoing research and current topics in biomedical sciences. This course will provide an opportunity for students to integrate and apply knowledge and skills gained from their graduate studies. Emphasis will be placed on primary literature, laboratory visits and practices, and on effective, professional communication and presentations. Topics and instructors will vary from semester to semester. Priority will initially be given to graduate students participating in the neuroscience concentration; other students with the necessary prerequisites will be admitted on a space available basis. This seminar is a journal club covering high impact papers that use novel animal models and/or translational research approaches. Trainees learn to effectively present findings and conclusions from and critically evaluate published research. Part of the discussion is devoted the appropriate use of animal models of disease and how they impact discovery and translational research in the context of the paper being presented. Other topics included in the discussion are related to translational research, including areas of application, clinical evaluation of new discoveries, and the process of drug development from discovery to market including clinical trial design. This course in an intensive review of the current and recent literature in zoological health focused on the ACZM reading recommendations. This course is designed for students studying for their specialty board examinations. Students have monthly assignments reviewing assigned components of the literature and weekly take the assigned quizzes. It is set up fully online with reading assignments and requirements to submit questions into a database from which quizzes are generated and taken. There is no maximum number of students. It is only useful for students preparing for ACZM or ECZM board examinations. This is a journal club activity. Students take turns leading the discussion on an article or group of journal articles they have selected in the field of Pharmacology. Selected topics of current interest in immunology. A different topic will be covered each semester to focus on the most recent developments in the field. Selected topics of current interest in clinical zoological medicine focused on marine mammals, fish, reptiles, amphibians, waterfowl, ratites, raptors and medical issues in free-ranging wildlife. Review of current clinical and basic science literature, student-lead discussion sessions and participation in faculty-lead discussions. A student who fails (a grade of D or F) a core course will be dismissed from the CBS Graduate Program. All first year students who have less than a B grade in any of the CBS core courses or an overall average of less than 3.0 will be reviewed by the Graduate Studies Committee and Program Director. A student’s status in the program is based upon academic performance and reasonable progress in research. If a student is permitted to remain in the program, the form of remediation will be decided by the Graduate Studies Committee and the student’s adviser. The conduct and execution of the research problem will be the responsibility of the student’s adviser and his/her dissertation committee. The student is expected to make reasonable progress in their research, and to attend at least one national meeting as a student to present data from their research. To ensure that Graduate Students have the opportunity to actively participate in their program of study, students will have elected representation on the CBS Graduate Studies Committee. This will be in the form of one student who is elected by the CBS graduate students. The term of service will be for two years. The student representative shall attend all Committee meetings and make contributions that serve student interests. It will be the responsibility of the student representative to disseminate information from the meetings and to raise issues on behalf of the students. First year students will not be eligible for election to the CBS Graduate Studies Committee. Election of the student representative will take place during the Spring semester, with the term of service beginning on the following July 1.